A listing of all the articles written by Mike Gottlieb for the RotoWire Blog. Not even June 1st and I’m already moving into Fantasy Football season. It’s never too early to get a leg up on your opponents in what is the best fantasy sport around. Sure, there’s baseball, but that’s for marathon runners. I’m more of a sprinter. I’ll take football and its 16 weeks of agonizing ecstasy. It also helps that the games themselves are actually watchable, unlike in baseball. 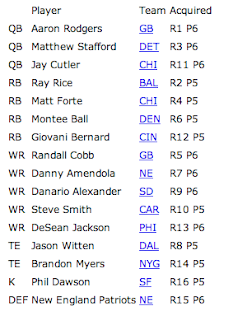 Thursday night I participated in Rotowire’s #MockDraftArmy draft hosted by Mock Draft Central. It was a 10-team, 2-QB draft that had some interesting results. Here is my team. How did I do? Revisionist history is fun, right? Hind sight is always 20-20. But this theory is neither revisionist nor hind sight. Not drafting pitchers early in fantasy baseball drafts is not new. The following is a fifteen-pitcher starting pitching staff (fourteen of them not named Matt Harvey) with an ADP of 200 or higher and their stats this year, so far (as of 5/11/13). It will make you feel kind of silly for drafting David Price, Cole Hamels, Gio Gonzalez, or others of their ilk. HOWEVER, if you happen to have any number of these 15 pitchers, sell high while you still can. Try to get one of the struggling aces. Get your profit from your home run of a draft pick. If you check out the RotoWire YouTube page, @Chris|UNDER|Liss and @Jeff|UNDER|Erickson discuss whether they’d trade Matt Harvey for David Price or Cole Hamels straight up. The answer is not so straight forward. Another reason why you trade for the top pitchers instead of drafting them. Too much uncertainty in pitching. Just imagine if you drafted one-third of these guys and combine them with some of the lower-ranked closers or highest-ranked set up men who have become closers off the waiver wire. Unless you had the worst strategy picking hitters at the top of the draft, you’d be profitting from fantasy baseball this year. Today is like Christmas for NFL teams. Some teams will have their stockings stuffed with gifts, and some with coal. Until today, I have undertook the impossible practice of predicting the picks without trades. Today, I make an even more ridiculous prediction by trying to predict the trades that will happen in tonight’s first round of the NFL Draft. Enjoy the craziness that follows. It’ll make tonight seem rather tame. The Green means a team traded up to that spot, the pale red means the team traded down. All in all there were five trades predicted. 2013 NFL Mock Draft: Two Weeks to Go! Only Two weeks until the real NFL Draft takes place, and I look like an absolute fool for even trying to predict what actually happens. I am operating under the assumption that there will not be any trades. With that being said, I fully expect there to be a significant amount of movement, starting with the Cleveland Browns at pick #6. This draft isn’t loaded with elite talent, but it is a very deep draft and there is a ton of quality that can be found in later rounds. 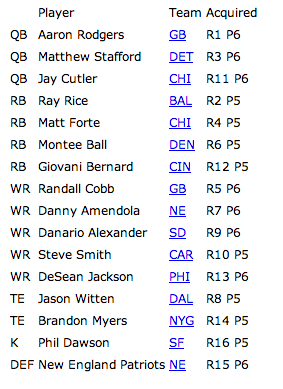 This is another draft where a QB did not make it into the first round because I am basing a lot of this off of team need/talent available. 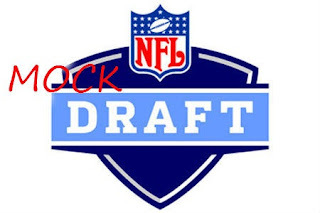 I’m sure that there will be QBs taken in the first round in the real draft, but I think it will be at the end of the first round with teams that have an early second round pick trading back into the first round to ensure they get their guy. With all that being said, here’s my latest mock draft. Enjoy! Just in case you have not heard, the NFL begins tomorrow night with the Dallas Cowboys facing off against the World Champion New York Giants. This means that fantasy football is set to begin and, just as important, betting season is set to begin. To get the latter started off, I have compiled my NFL team prop bets and confidence behind each pick, based on the website formerly known as BoDog’s lines. Enjoy! Chicago Bears (9.5) Over: The NFC North should get three teams in the playoffs, and the Bears are that third team. Brandon Marshall makes that team infinitely better. Three wins without a loss in quarterfinals predictions so far, but today’s game is the toughest to predict because there is very little separating the two teams. Both England and Italy, two traditional powerhouses, had low expectations entering the tournament. Italy is entombed by its match fixing scandal that forced defender Domenico Criscito to pull out of the tournament days before likely being selected to the final team. Meanwhile, England named Roy Hodgson its manager only weeks before the tournament was set to begin. Why the late decision? Because former coach Fabio Capello would not strip the then English captain John Terry of his captaincy in light of his alleged racial abuse. By the way, John Terry was still selected to the team and still is featured in a prominent role much to the chagrin of some black players. This is another reason why sports is the best reality TV. Italy’s American Team Doppelganger: Syracuse University Men’s Basketball Team. Whether it’s child molestation, homophobia, or racism allegations surrounding these teams, they just seem to get better. Somehow, these teams find a way to unite and find a way to win. When Italy was faced with a similar scandal in 2006, they went on to win the World Cup. Unity through adversity is the name of the game for the Azzurri. England’s American Doppelganger: San Francisco 49ers. Both team’s hired new coaches and the style of play has not been well received by everyone, especially in England’s case. The beautiful game has become the pragmatic game for England, who coincidentally resemble the play of Italian squads in the past who are looking to win 1-0 and call it a day. With that being said, England looks very well organized and has caused every team facing them problems with their stifling defense. The offense is doing just enough to win them games, but now they are facing an opponent who will be just as prepared as them. And just as talented. 2-0 in the quarterfinals, so far. However, the next two games are significantly harder to pick than the previous two. Today reigning champion Spain faces off against the, until recently, undefeated French since the 2010 World Cup. The key to the game will be, like in all games against Spain, how much ball possession can France muster? Spain is so good at playing keep away and nullifying any attacking threat on the field. The winner of the possession game will win the game. Spain’s American Doppelganger: Peyton Manning-led Indianapolis Colts. Simply put, they both play a brand of football that is not duplicated and have both won everything there is to be won. Their best defense is their vastly superior offense. They both depend heavily on steady ball distribution rather than the big play. That’s not to say however, they are not high scoring, because they are. Entertainment via dominance. France’s American Doppelganger: Miami Hurricanes of the 80s/90s. The only difference, and it is a significant one, is that the Hurricanes won championships. However, the spirit of both teams is eerily familiar. Both teams have enigmatic stars who are bound to fly off the handle at any time, in good ways and bad. French star Franck Ribery punched club teammate and Dutch star Arjen Robben over who took a free kick. The French team revolted in the only way it knew how in the 2010 World Cup by resigning the whole campaign and walking out on the tournament. However, since then they have lost only once in 23 matches. Their brand of football is entertaining and they have good talent at every position. Which France will show up today?